This weekend I managed to go through some of my favorite Polish magazines. One of them is ELLE with new updates about fashion and more! Of course I could not resist trying to do the recipe of Zofia Cudny. Zofia has a blog with the name Makecookingeasier.pl that I can recommend for you! 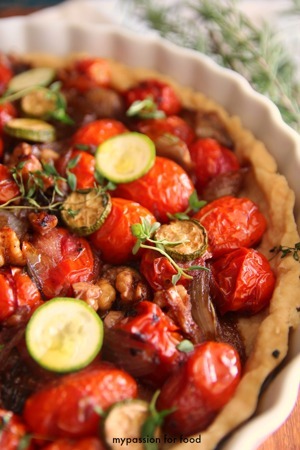 This time she wrote about French Tarta Tatin with cherries tomatoes and caramelized charlotte onions. 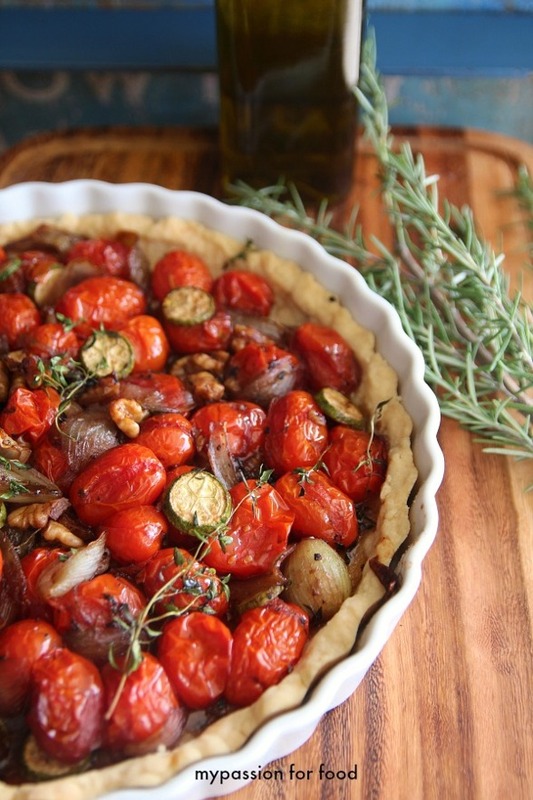 I modified her recipe and here you have my version of Cherry Tomato Pie with Charlotte Onions and Walnuts. Once I was ready with cooking I started the process of food styling and photograpy! I love this part and it gives me so much joy when things work out. The pie was delicious, the friends were satisfied and I was happy with the photos. Great weekend and great beginning of new exciting week for all of you! Don´t forget to drink some good Rosé wine! First, make the pastry. In a food processor, mix the flour, butter and water. Mix until it comes together in a dough. Remove the dough from the mixer bowl. Wrap in clingfilm and put in the freezer to chill for at least an hour. On a flat, floured surface, roll the dough with a rolling pin until you get a circle about 40 cm in diameter. Cover the bottom of a 25 cm in diameter baking deep dish, make sure that the sides of the dish are well covered too. Set aside. Melt butter in a heavy based frying pan; add sugar. Allow the sugar to caramelize a little and become a pale golden brown. Add charlotte onion halves and let them fry 10-15 minutes on a low-heat until they become golden brown. Add the cherry tomatoes, fresh thyme, walnuts and balsamic vinegar and fry it for 10 minutes. Place cherry tomatoes filling in the form covered with dough. Bake the pie for 30 minutes or until the top is lightly golden brown. Serve with a crisp green salad and a chilled Rosé wine!